In the historic center of Ribeauvillé (November 2018). Situated in the heart of the route des Vins, the villages of Riquewihr (pronounced “reek-veer”), Hunawihr, and Ribeauvillé are considered some of the most-beautiful in the Alsace region. 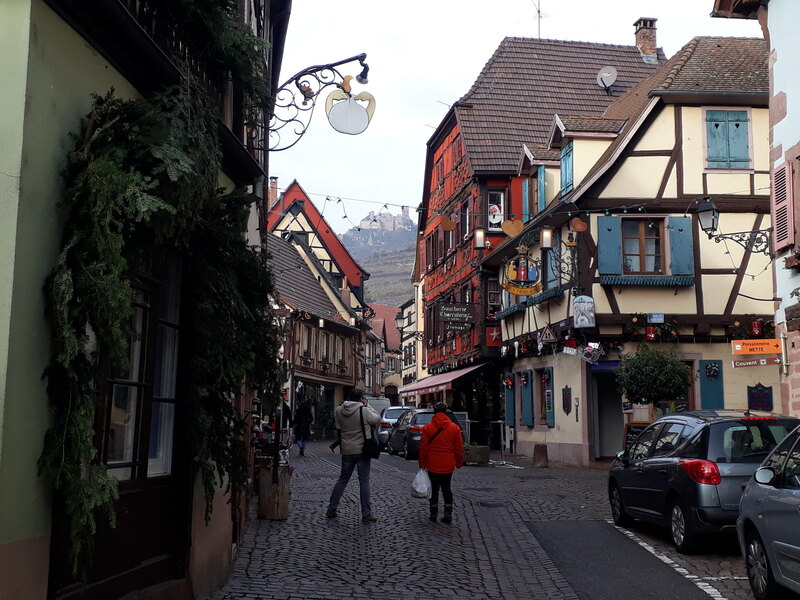 Not only that, but the villages of Riquewihr and Hunawihr are listed as part of the “les Plus Beaux Villages de France” (“Most Beautiful Villages of France”). Riquewihr had especially been on my bucket list of places to visit for a while, so I knew that I had to make it there while in Alsace this November. 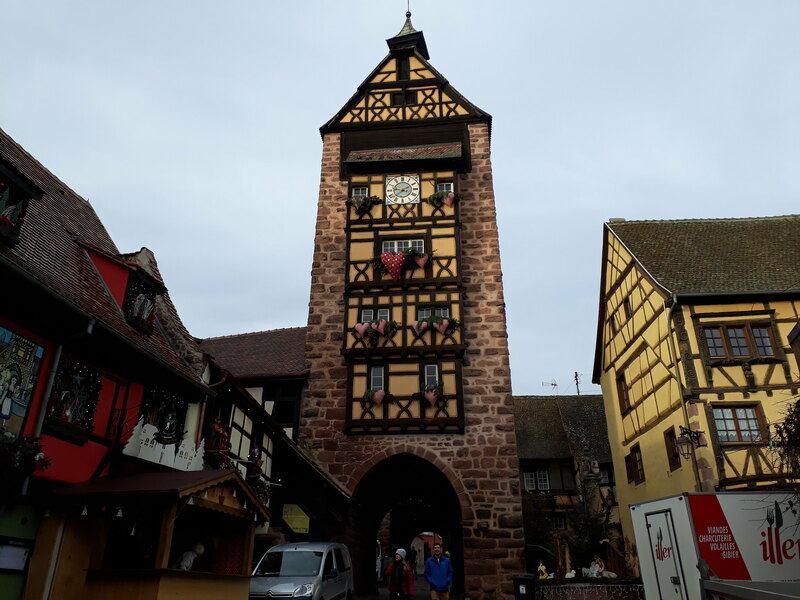 Just like how it was with Eguisheim (also on the list of pretty French villages), getting to Riquewihr, Hunawihr, and Ribeauvillé wasn’t easy, as it required taking regional buses from Colmar at certain times, due to limited operating hours. However, it wasn’t impossible, as I planned ahead and made sure to time it well getting to each village, as well as to make it back to Colmar at the end of the day (to get back to Strasbourg). I caught an early-morning train (before 7:00) to Colmar, arriving in around 7:30. From there, I took the line 106 regional bus to Riquewihr. Perhaps it’s because the village is touristy, but I was surprised how expensive the bus fare was for a single-way, which was close to 4 euros. In any case, I paid the driver and settled into my seat for the 30 to 40-minute ride to Riquewihr. The bus dropped me off at the village’s post office, which was just outside the fortifications of its historic center. 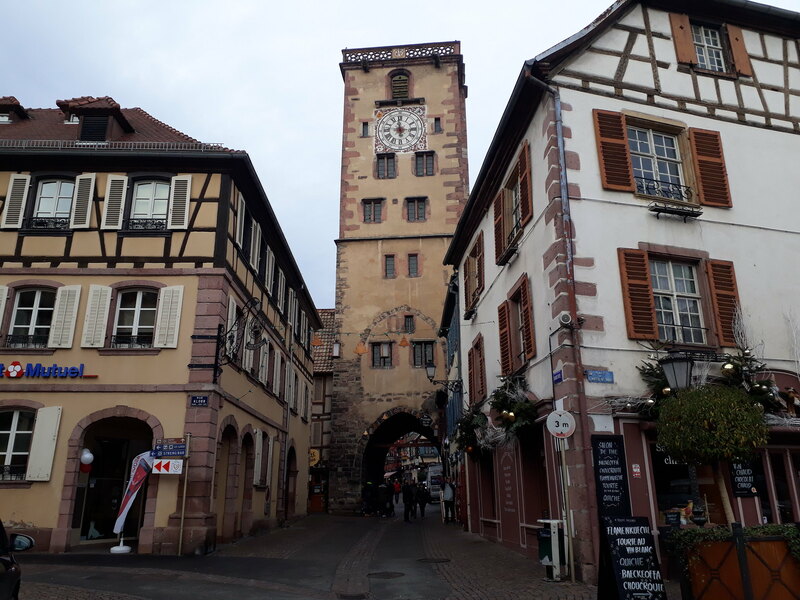 I passed under the gate of its hôtel de Ville before strolling its grande Rue, the main street of Riquewihr. As I arrived much too early (8:20) for shops, let alone tourism, to be open, I killed time by strolling the small side streets of its old town. It didn’t take long to complete, however, as I walked just about every single street in 45 minutes. Colorful half-timbered houses in Riquewihr. It’s without a doubt that Riquewihr is really pretty– after all, it’s one of the two villages (along with Ribeauvillé) that inspired the architecture in Beauty and the Beast. It has also been extremely well-preserved, since it managed to survive unscathed during the German bombings of World War II. Strolling the streets filled with colorful half-timbered houses, I felt as if I stepped back in time to the 17th century. After buying a postcard and a Christmas vin chaud mug at one of the shops, I left Riquewihr for the next village. 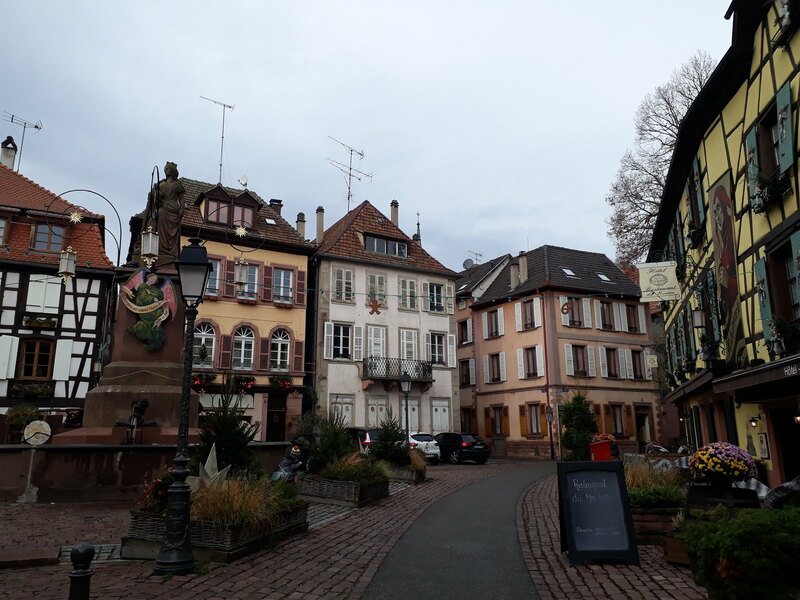 Originally, I’d planned just to visit Riquewihr and Ribeauvillé, but then I decided to take the scenic pedestrian route that connected the two villages together, with a brief stop in Hunawihr. Besides getting to enjoy the gorgeous, sweeping vineyards of the wine country, I also could save money on the bus fare, since it was so pricey. The walk from Riquewihr to Hunawihr only took half-an-hour. Along the way, I saw acres of vineyards, barren but still golden in the late-autumn weather. A couple of grapes were still left surviving on the trellises, albeit small. The views were all gorgeous, and I was virtually the only person on the walk in the middle of nowhere. It’s in these seemingly mundane moments of travel that are the most fruitful– the progress, not the result. View of Riquewihr from the vineyard. On the way to Hunawihr. I reached Hunawihr, where I didn’t spend too much time. 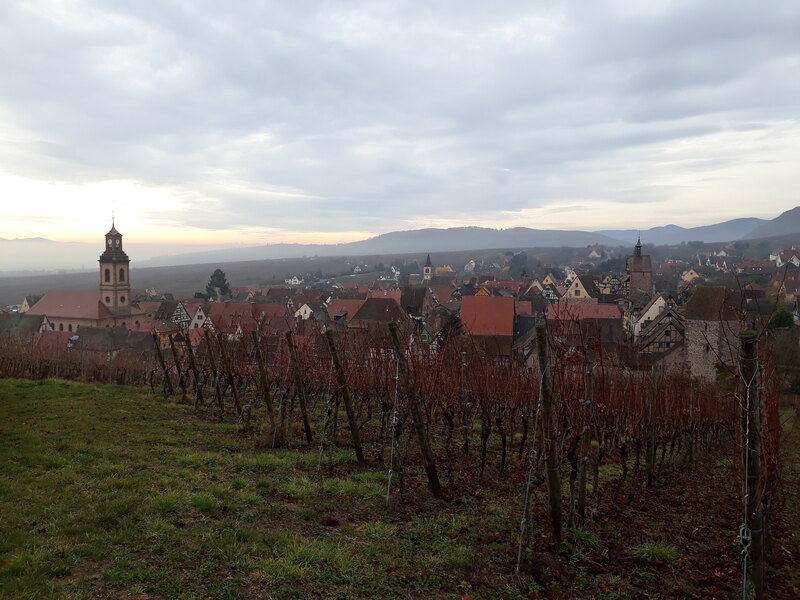 The only main draw of this village of less than 600 inhabitants is its fortified église Saint-Jacques-le-Majeur, which overlooks a sweeping field of vineyards for that perfect photo opportunity of the Alsatian countryside. I didn’t go inside the church, but merely headed down to the vineyards in front of it to get that iconic photo of the building surrounded by the rows of trellises. 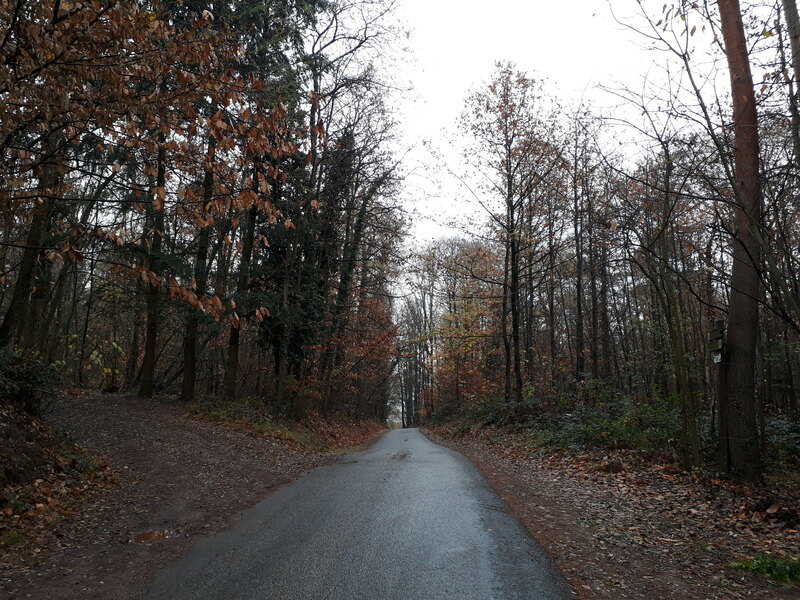 After perhaps a 30-minute visit, I left Hunawihr to continue on to Ribeauvillé. 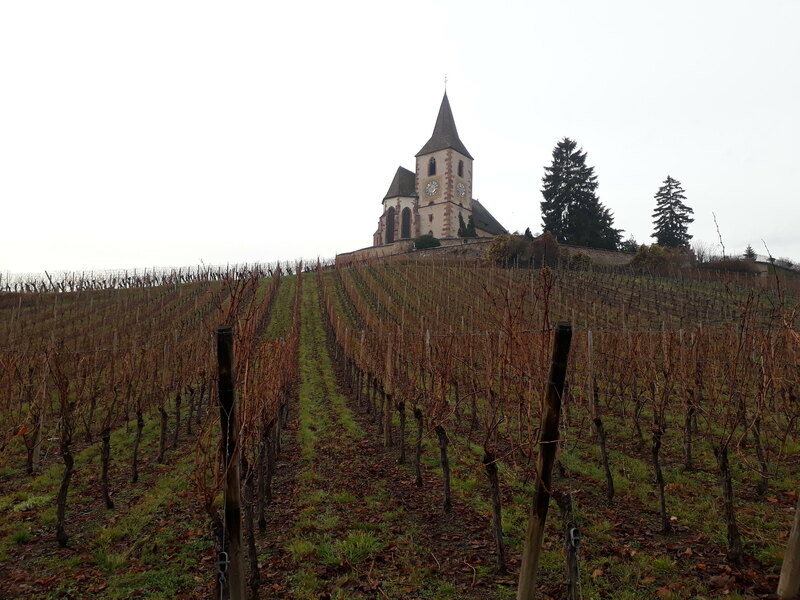 View of église Saint-Jacques-le-Majeur from the vineyard. It was another half-hour walk to my final stop of the day. 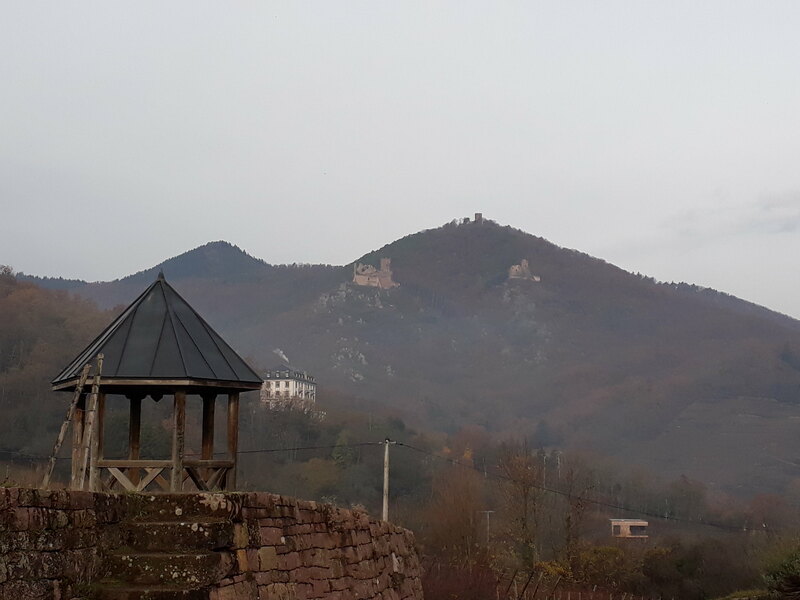 Besides seeing more vineyards, I also got a glimpse of les trois châteaux de Ribeauvillé (“Three Castles of Ribeauvillé”) clustered together on a hill in the distance. Not to be confused with those of Haut-Eguisheim (located near the village of Eguisheim), these three castles are architecturally-similar to what one would find in Germany, and they make for an impressive sight while taking a walk in the countryside. Les trois châteaux de Ribeauvillé. I reached Ribeauvillé around half-past 11:00. Compared with Riquewihr and Hunawihr, Ribeauvillé is a larger village with about 5100 inhabitants, and it had more shops, sights, and overall things to do. I didn’t actually spend too much time sightseeing in Ribeauvillé, as I had lunch there and wanted to catch the next bus back to Colmar (around 13:00). 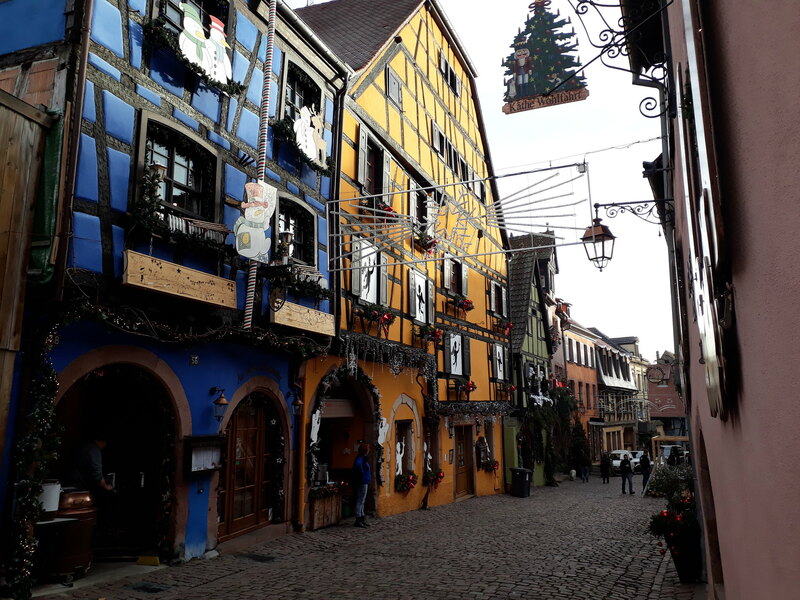 I did, however, do a quick tour around the historic center, which I actually liked more than Riquewihr’s– true, there were also colorful, half-timbered houses, but I found them more copious and just prettier. It was also bustling with tourists by then, which added a liveliness to the historic center. Entrance to the historic center. Fontaine au Cerf in the main square. After grabbing a kebab for lunch, I headed over to Ribeauvillé’s gare routière where I caught the 13:00 regional bus (line 109) back to Colmar. I returned close to 14:00, and from there decided to head back to Strasbourg early, thereby returning by mid-afternoon. Considering that I’d woken up super early that morning to visit the villages, I was exhausted by afternoon, and I desired to rest for the remainder of the day. Thank you for reading, and I’ll be recapping more of my travels from November in due course. Take care!